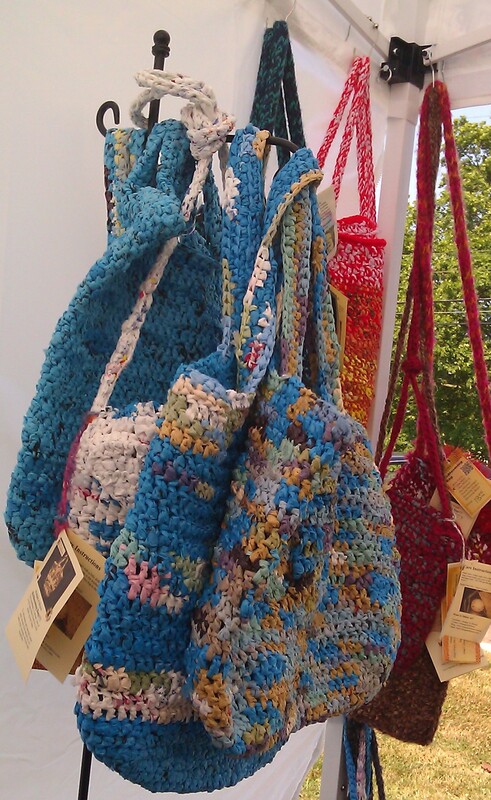 ReBlooming Bags – Upcycled plastic grocery bags used as yarn that is crochet into totes, purses and unique handbags. It is something that I have been doing for 4 years now. There is something inherently satisfying about taking plastic that would otherwise lay in its present state in landfills for generations and instead give it a new life, new purpose. I just wanted to spend a few moments telling you how i arrived at the name for my plarn bags. Reblooming Bags was the last of several iterations of names for my work. You just know i had to get my last name in there somewhere… Bloom. And as i mentioned, these plastic bags went from a one use and toss them out destiny to a new hope with a long term purpose. Some long thought, test marketing the name with family and friends… and now they are Reblooming Bags. I thought I was working in a modern medium, a new found interest in using these plastic bags but…. It only took a few art markets and festivals to begin to gather stories from people who had mothers of the great depression. With the advent of plastic bread bags in the early 50s frugal moms took the time to cut those bread bags and knit or crochet bookbags and school totes. How totally amazing that this idea of using plastic bags for a new purpose is not new… I feel blessed to be part of the frugal women’s club in the sense that I am using what i have, and repurposing it for a greater practical purpose. So here is a picture of a bag done in all bread bags. Not my work, but that of a respected friend. It looks incredible. I am growing eager to save up enough bread bags to get this project under way. I will post pictures as the project occurs. PS- We are less than 2 weeks to Tremont Art and Culture Festival. Hope you can stop out to visit…. Saturday, Sept 15 11a-6p, Sunday, Sept 16 Noon-5p in Lincoln Park, located at W14 and Starkweather Avenue in Cleveland’s Tremont (South Side) neighborhood. This is the 14th annual, and always an amazing time… great entertainment, over 90 artists, kids village, restaurant and church food, and so much more.